Many Eastern European cultures celebrate plums, a seasonal comfort fruit which is a perfect combination of both tart and sweet. 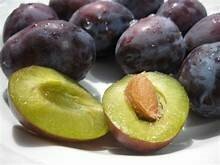 With plums in season right now childhood memories of plum cakes danced through my head. Every year I attempt to recreate the simple crusty dough my mother used to make for plum cakes and this year resisted temptation to resorting to Dr. Oetkers German Streusel cake mix as I have done in the past. Instead, I called my sister who in past years was the queen of plum cakes, harvesting plums from trees my parents planted decades ago. German people call them “Hauszwetschken” which means directly from the garden behind the house and for private use of the farmer/seller and therefore considered better than organic! This year she told me to look a recipe up for it was an off year for her Italian prune plums. So I began my search for a familiar recipe for plum cakes, plum tarts, plum kuchens that would be easy and taste delicious. 1 ¼ cups (175g) flour. any all-purpose will do. In autumn, when plums are in season, plum cake or Plumkuchen, is a traditional German-Jewish recipe for the high holidays, Rosh Hashanah, the Jewish New Year, and Yom Kippur. In classic Central European Jewish food tradition, cinnamon is commonly added. 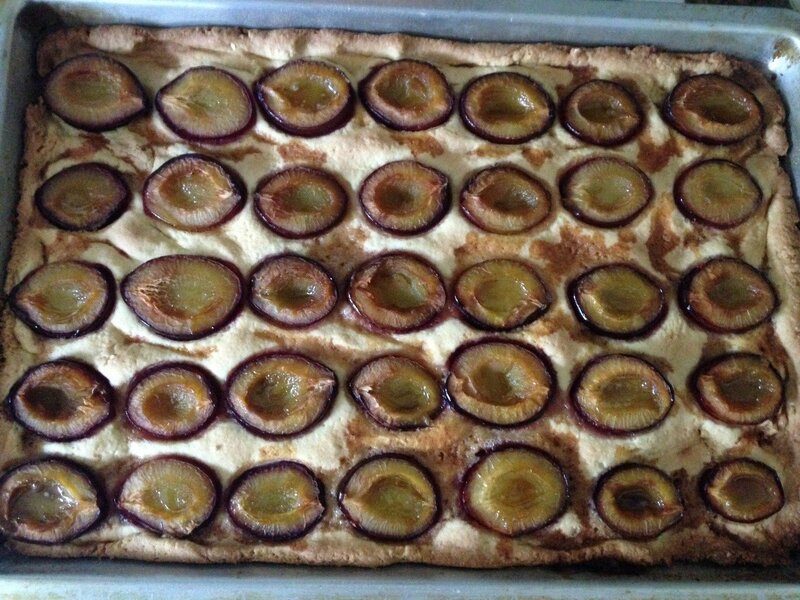 Plum cake is called a “plyatsok” in Ukrainian. I found out that it is a cake that is baked in a wide shallow baking sheet- definitely not a fluffy cake, and on the thinner side but the crumb is tender and soft. As the cake bakes, each piece creates its own little island and then it softens and caramelizes into a reservoir of syrupy sweetness! I drizzle honey on my plum halves for just the right amount of sweet tartness. Polish Plum cake or” Placek z Sliwkamy” has a variation with cloves added which gives the cake a strong spicy flavor. Sometimes vanilla extract is replaced with lemon juice for a tart glaze. In Austria traditionally you eat “Zwetschkenkuchen” lukewarm with a generous topping of unsugared whipped cream. 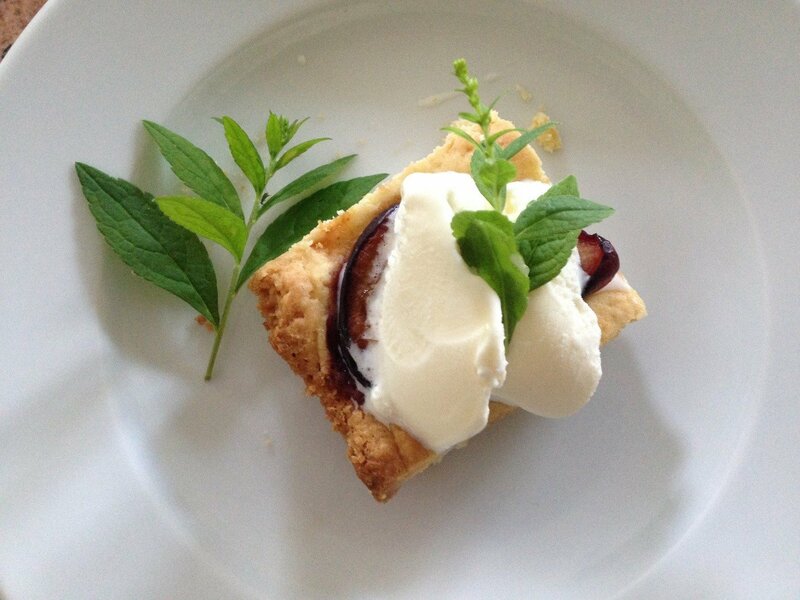 Here is my finished Plum cake warm out of the oven with a scoop of vanilla ice cream and mint garnish. It was heavenly! Feel free to send pics of this years plum cakes. For the health of it: Try to pick your own plums or purchase through CSA or other known source.